A glittering reception was hosted by High Commissioner Hamley Case at his Mission in Bayswater in the West End of London. In his opening address, High Commissioner Case pointed out the opportunities opening up in the emergent Oil and Gas Providence of Guyana. 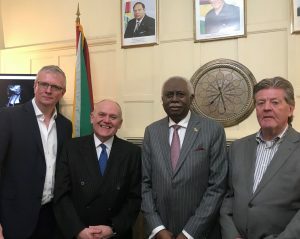 The event was jointly sponsored by Guyana High Commission to the UK and the ABIS Energy Group celebrating the recent twinning of Georgetown Guyana and Aberdeen in the UK. This is part of a bipartisan drive to engage the UK with Guyana and its capital city as Guyana takes its 1st steps toward becoming a major player on the global Oil and Gas stage. 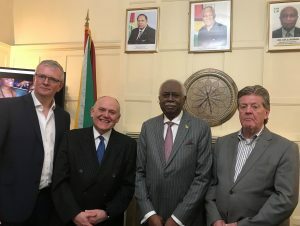 Aberdeen’s Lord Provost Barney Crockett was in London Thursday night, having recently been in Georgetown to formally sign the MOU Twinning the 2 cities. High Commissioner Greg Quinn joined the event from Georgetown by video link. High Commissioner Quinn echoed the sentiments as expressed by High Commissioner Case and endorsed the engagement of the two governments. 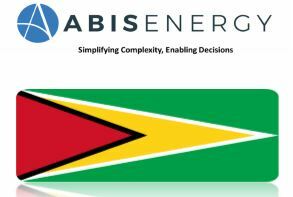 ABIS Energy Group Managing Director Francis Kiernan, who had been in Guyana for the historic twinning of the two cities, spoke of his satisfaction and sense of mission at the successful outcome. West Indies cricket legend and prominent Guyanese VIP Clive Lloyd CBE was a special guest and made an address to the guests, asking for partnership and reconciliation across the political parties. The event was attended by several Oilco’s and by UK Govt Agencies. Jonny Hargreaves of Tullow, Martin Smith Tangram Energy, Gareth Wynn Oil Gas UK to name but a few. Also in attendance was Brian Archer Business Development Director for Burness Paull, Sally Gibson Petro Legal, Dr Marcia Persuad Goldsmith Chambers. The evening was chaired by John Mair.